Arrive late at night at a campground with your dog in tow, and others may wonder how you’ll ever get your dog to sleep there rather than back in your warm, cozy house. 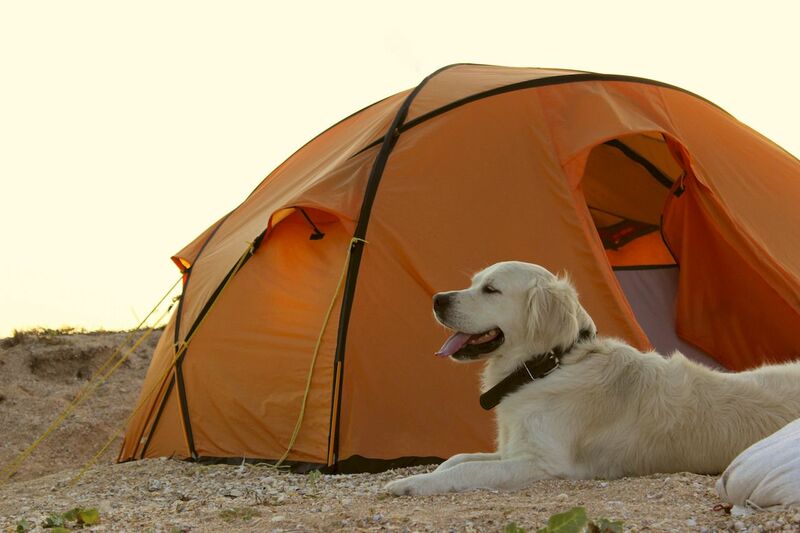 While squeezing in a tent with your furry friend may not be the most glamorous part of taking your dog into the great outdoors, the next morning, your pup will be in doggy paradise, and it’ll all have been worth it. Whether at a coastal campground, in the desert, or at a forested mountain spot, the outdoors is where most dogs are in their element. But the outdoors can carry risks for your four-legged companion — like exposure, other animals, cliffs, and thirst — as it does for humans. Here’s how to be sure your dog has just as good a time as you do. Match the trip to the dog. When planning any trip with your pooch, ask yourself three questions: 1) Are dogs allowed? 2) Is it safe for my dog? and 3) Will my dog enjoy it? Then think carefully about where you’ll be staying, the sort of activities you have planned, the time of year, and how well-behaved your pup is. You might be able to take a well-trained dog on a canoeing trip, for example, but whitewater rafting trip with a petulant puppy should be a non-starter. If your dog is getting on in years, that planned twelve-mile hike could be ambitious and potentially unsafe for your pet. Just because dogs love being out in nature doesn’t mean that all outdoor locations are as welcoming to Fido or Fifi as you’d like them to be. 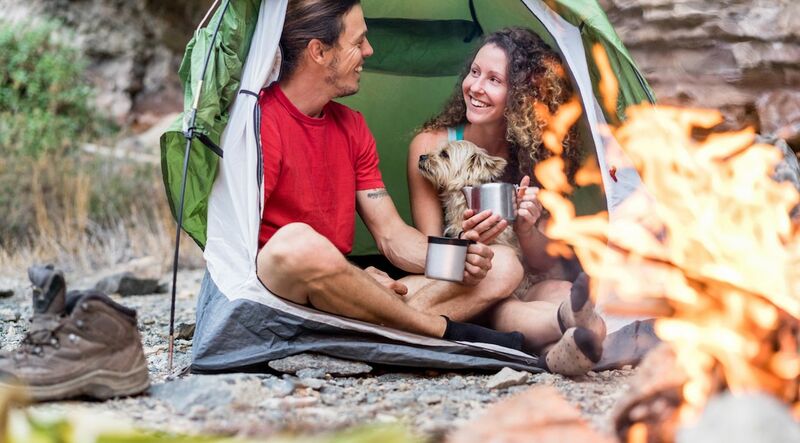 Yosemite National Park allows dogs in most campgrounds and developed areas, but dogs are not allowed at a few campsites and on trails — even if they’re on a leash. If you want to hike all day, Yosemite would not be the choice. US national forests have friendlier dog policies than national parks. In national forests, dogs are allowed on trails and don’t even need to be leashed in some wilderness areas. 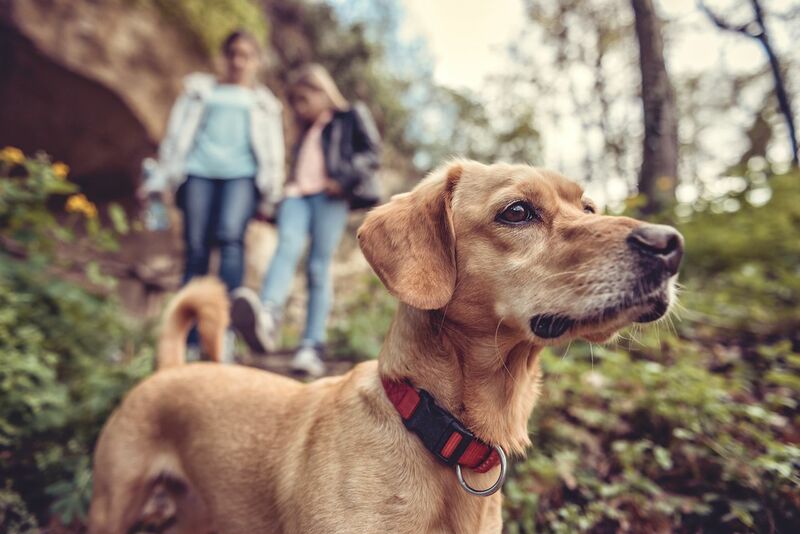 Canadian national parks also permit dogs on trails, but none of these places let you leave your dog alone at camp — so be sure that all your planned activities are dog-friendly. Know what risks your dog may be exposed to. Once you’ve decided where you’re going, consider the risks your hound may encounter. Find out whether your campsite has shade, what animals are nearby, and even the local flora. Ivy, mushrooms, and certain wildflowers can be lethal to dogs. Even if your pet isn’t one to munch on foreign plants, in places like California, they can bring plant toxins back to humans in the form of poison oak or poison ivy oils on their fur. You should also consider whether cliffs or gulches can endanger your off-leash puppy. Dehydration can also be a major risk, so it’s very important to have enough fresh drinking water to share between the two of you. It may be tempting to let your dog drink from streams or ponds, but that puts the dog at risk for getting giardia — a parasite that lives in the intestines and causes diarrhea. Pack everything your dog might need. Be sure it has their name, registration details, and contact info. Keep a photo of Spot in your phone or even printed on paper. In case Spot gets lost, you can show his or her picture to the rangers or nearby campers. This should go without saying. Dogs must be leashed in many areas, and even where being unleashed is permitted, letting your dog run free increases the risk of them confronting a coyote or cougar. The average daily water intake for a dog is about three to six ounces for every five pounds of body weight, so fill containers with six ounces of water per five pounds of dog — plus a bit more for emergencies. Dog poop in national parks adds foreign bacteria to the ecosystem and pollutes waterways. Just like back in the city, you should clean up after your dog. This is a good one for outdoor enthusiasts in snake-prone areas. Beyond keeping your hound safe, snake repellent will keep you protected, as well. If you’re camping somewhere with little shade, a shade canopy is a good investment and has the added benefit of keeping you cool, as well. If you’re hiking where there’s poison oak or poison ivy, a good wash with cold water (if you have access to running water) and dish soap will wash the poisonous plant oils off their fur. Bring the items that will help your dog feel more at home. Their favorite toy will give them something to play with. Bring frisbees or balls to play fetch. If your little canine has a doggy bed at home, bring it along. You’ll automatically have somewhere at camp they’ll recognise as theirs. If you’re camping far from others where your dog is permitted to be off-leash, tying them to a tree with a long rope will give them more freedom to explore without getting lost. Designate space for your dog at camp. Don’t panic if you can’t take all your dog’s worldly possessions. Just make sure they have a designated space wherever you’re staying. Having a small spot that they recognize as theirs, whether it’s their bed or simply a spot of shade where you can easily leash them, will give them somewhere to relax. You may find this useful when it’s time to eat. You can send your canine companion to bed while you’re having dinner, and welcome them back to enjoy the leftovers when you’re done. Train your dog to get used to your activity. If you’re lucky enough to be able to take your dog with you on your activity, it helps if you can give them a trial run first. 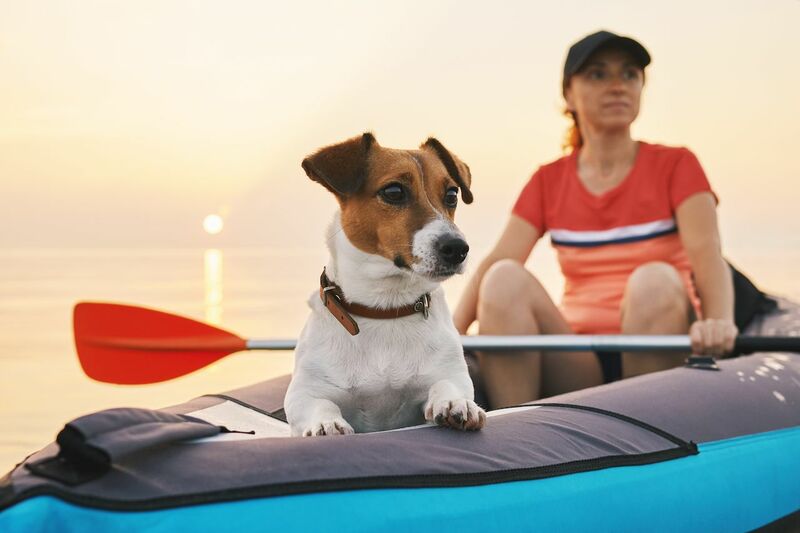 A short canoe trip in shallow water, a quick walk on the trails, or even just camping in your backyard will help you stay calm knowing that your dog won’t get scared or wake up in the middle of the night. Just like humans, dogs also need to build up endurance for activities, so don’t expect them to be able to do a long-distance trek if the most exercise they’ve ever gotten is a quick jaunt around the block. Also, take into consideration your dog’s breed; certain breeds like greyhounds are more prone to injury than hardy pit bulls and run a greater risk of breaking a bone on a hike. Other northern breeds are more susceptible to overheating. Tiny toy breeds are unlikely to be able to scramble up rocks, and if you have no idea if your dog can swim or not, a camping trip to the lake is probably not the time to find out. Try to give your dog some routine. At home, you probably feed your dog at the same time every day. Try to keep it up on your outdoor adventure, stopping during the car trip on your way there at mealtime if need be. If you take your dog out for a walk in the morning at home, do the same on your outdoor adventure. The same goes for taking them to go to the bathroom. 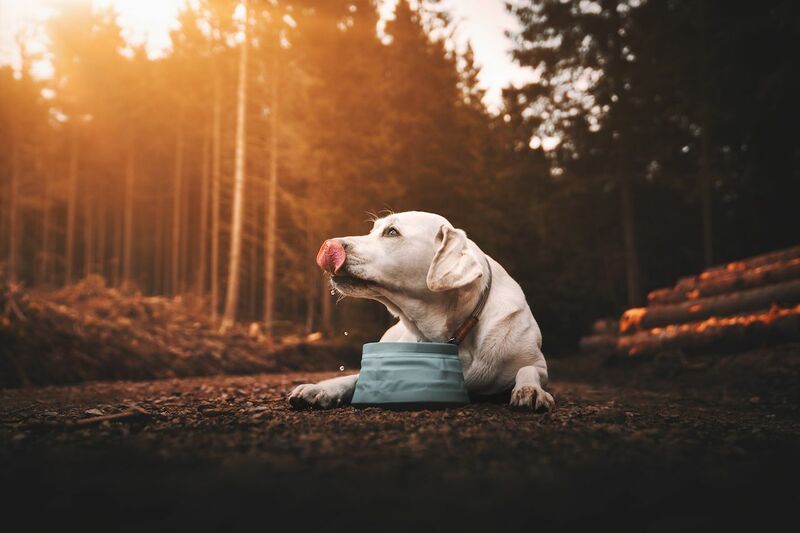 For those rare outdoor trips where your dog can safely and securely be left unattended for a while, be sure you get back at the same time you’d return if you were at home in the city, and feed them at the same time, too. Knowing what time you’re coming back and when they’ll get fed will make your dog less likely to get scared by being somewhere unfamiliar. To avoid a howling, stressed pup, consider not taking your dog on every single walk around the campground, like if you’re just going to the bathroom or getting more water from a pump. Having your dog follow your every move will just make it more difficult to separate in the event that you need to, such as if you’re going surfing and your dog has to stay tethered under the shade at the beach. 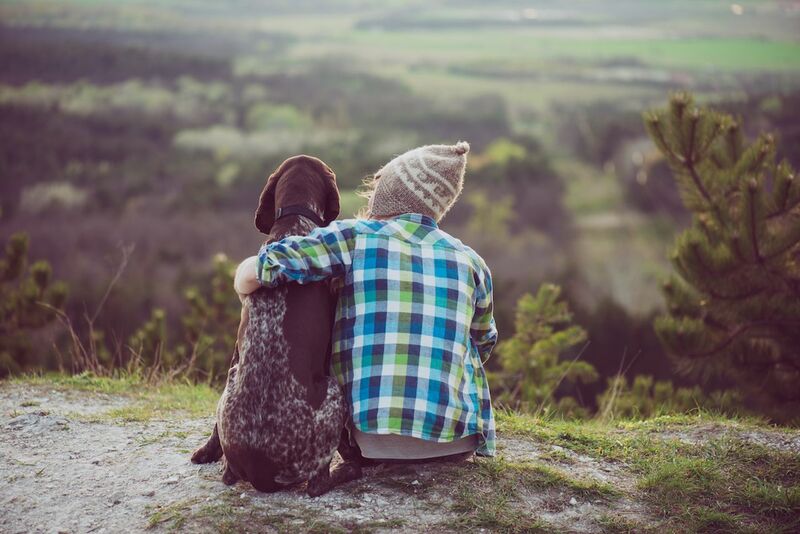 Relax and enjoy the time with your best friend. Canoeing, hiking, or surfing might be the main focus of your trip, but if you’ve made the effort to bring your dog with you, you might as well both enjoy yourselves. 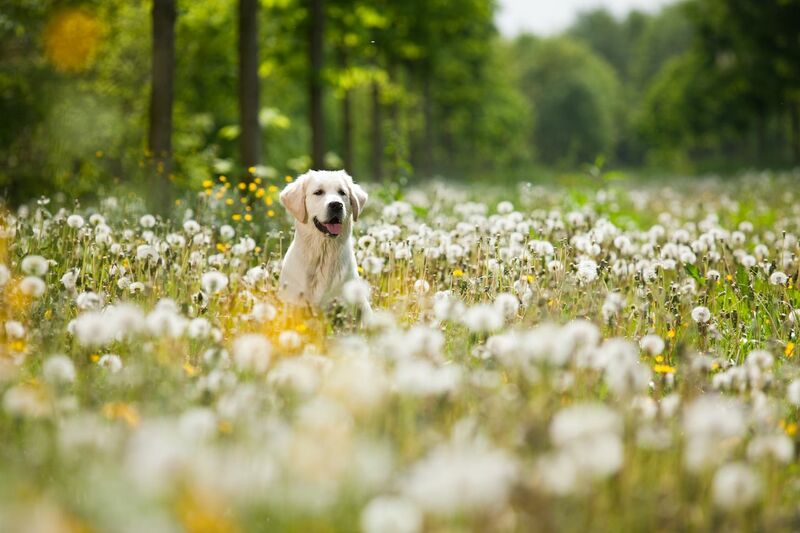 When you explore the local area with your dog, they’ll love being able to make the most of their natural instincts and get in touch with their wild side. Set aside time to do their favorite activities, whether that’s fetch or belly rubs. 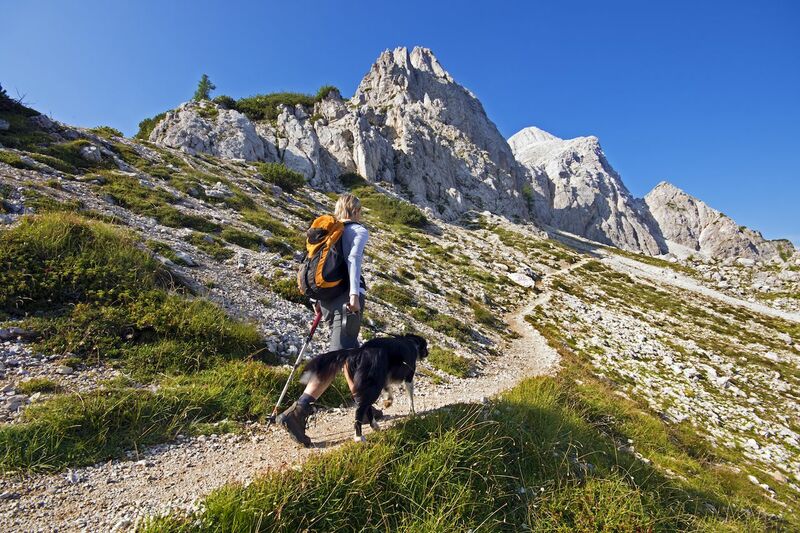 After a few adventures, you may find that your dog is the best outdoor companion you could ask for.